Time to visit Mt. Rainier National Park. The lower elevation trails have all melted out, but the Passes are now plowed and roads are opening. Hike to waterfalls. Snowshoe or do some ski touring. Or simply take a scenic drive. It’s wonderful to visit the Park before the summer crowds. Cayuse Pass (Highway 123) is scheduled to open May 19, giving you access to Crystal Lakes, the Eastside Trail, Shriner Peak and the Ohanapecosh area with the Grove of the Patriarchs and Silver Falls. Expect snow-free hiking in the Ohanapecosh area and on the Eastside Trail, but you will hit snow as you climb — and there are still some incredible snow banks on Cayuse Pass! The Sunrise Road to the White River Campground (half way up) is expected to open shortly afterwards, with access to the Emmons Moraine, Glacier Basin, Owyhigh Lakes & Summerland Trails. As of May 9, the road is plowed to the ranger station, with one lane plowed probably another 2 miles. The snow blowers are working, so our fingers are crossed! Chinook Pass and the Stevens Canyon Road (to Paradise) are scheduled to open May 26. Chinook Pass is our favorite place for spring/early summer snow play and snowshoeing, and we love the drive to Paradise. Keep an eye on the Mt. 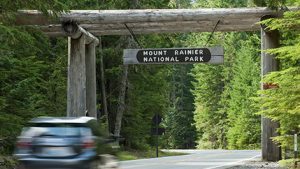 Rainier National Park website for updates. We are always excited to have the Park open again.